Product #21548 | SKU PWR-POLE | 0.0 (no ratings yet) Thanks for your rating! 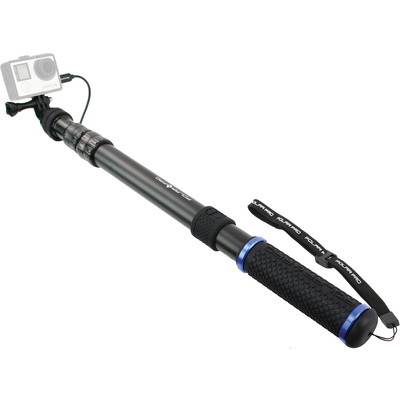 The PowerPole from Polar Pro is a telescopic extension pole for GoPro HERO cameras with an integrated 5400mAh battery that allows you to film for up to 10 hours on a single charge. It extends from 43.2 x 76.2 cm; and has an all-aluminum construction, making the pole is both durable and lightweight at only 368.5 g. The pole features a three-prong GoPro mounting interface and two full size USB power outputs for charging multiple devices at once. The PowerPole's battery is recharged via micro-USB port right above the grip. In order to charge/power your GoPro HERO camera while filming, you will need to use a frame or housing that allows access to camera's the mini USB port. Please note: While the pole has splash resistant bands covering exposed ports, the pole is NOT waterproof and is intended for above water use.